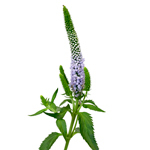 Veronica Flower Periwinkle Lavender is a unique filler that features tall, slender stems and numerous soft purple florets. Delicately colored flowers and glossy green leaves make these perfect for a baby shower, bridal shower or classic wedding. Sweet and romantic, these are hard to resist. If your event is Saturday suggested delivery day is Wednesday or Thursday. 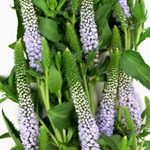 Veronica flowers are shipped with 10 stems per bunch. Each stem features one focal flower. Some stems may have off shoots. Veronica Flowers have a natural bend. Even when fully hydrated, the bloom may have curvature. It is normal for Veronica to shed upon arrival. 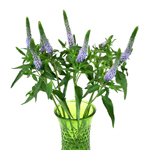 Veronica blooms feature rounded or bill-shaped bloom tips. Expected vase life is an average minimum of 5 days with proper care and handling.